Are you investing in a life that matters to you? Do you look back at the end of each day and feel like you managed life (or survived it) or do you feel like you lived it... and lived it well? If I am honest, I feel like most days I am just managing all the pieces while in survival mode and hoping to make it to bedtime without cracking. I feel far too much guilt on a daily basis over choices that I make (or don't make) or ways that I spend my time (or don't spend my time). Lately I have spent a lot of time thinking about what I want my kids to remember about me and the time we have together while they are little. As my littlest turns three next month I feel torn between wanting him to grow and wanting him to stay the adorable little cheerful guy that he is right now in this very second. There are many days after my kids are asleep that I count the moments of connection that I missed and wish for a re-do. Do you ever feel that way? Reading Rachel's new book Hands Free Life: Nine Habits for Overcoming Distraction, Living Better, and Loving More has been inspiring and healing. I loved in the intro when she says, "It is time you lay your head on your pillow at night knowing you achieved something of significance-- not in terms of societal standards, but in terms of the light in your child's eyes, the curve of your spouse's lips, and the beat of your very own heart. I often measure my day by how clean my house is, how many errands I run, emails I answer... or even how many activities we fit into the day... when really that is secondary to the connections I make with actual people (especially my family members) each day. In Rachel's new book she shares 9 habits that help you focus on investing in the most significant parts of your life. 1. Fill the Spaces ... by being fully present during those little pockets of time in your day − meals at the table, caring for pets, walking around the block, morning send-offs, afternoon greetings, nightly tuck-ins −all hold great potential to be all there. Nightly tuck-ins are so important, but they have been probably my least favorite part of the day. My kids are the cutest at bedtime... but they like to drag it out forever and I am usually so exhausted and impatient that I am always happy to turn tuck-ins over to my husband. Lately I have embraced them and made them my favorite part of the day. With the school year just starting I created some new bedtime connection routines with each of my three kids and now I have begun to love that time of night. 2. Surrender Control ... by resisting the urge to micromanage your life and those lives around you. From time to time, choose to feel the joy of carefree living and allow everything and everyone to simply be. Wow I am the ultimate micromanager of my kids, husband,... really anybody and everybody. Letting things be and not always taking the lead in things is hard, but worth it sometimes. I have begun to realize how capable my kids are as I have stepped back and let them be more responsible and in control. 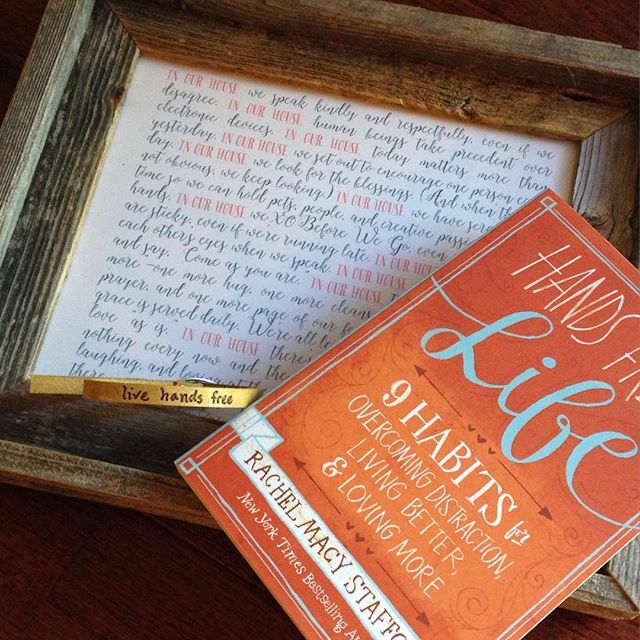 Along with a copy of Hands Free Life: Nine Habits for Overcoming Distraction, Living Better, and Loving More and a "Live hands free" bracelet, Rachel recently sent me a copy of her Hands Free House Rules that are now prominently displayed in our home. My favorite portion of the House rules reads, "IN OUR HOUSE we put living, laughing, and loving at the top priority list. IN OUR HOUSE there is room for mistakes and room to breathe." There are a lot of mistakes in our home and I have to ask for forgiveness often, so these rules are perfect. 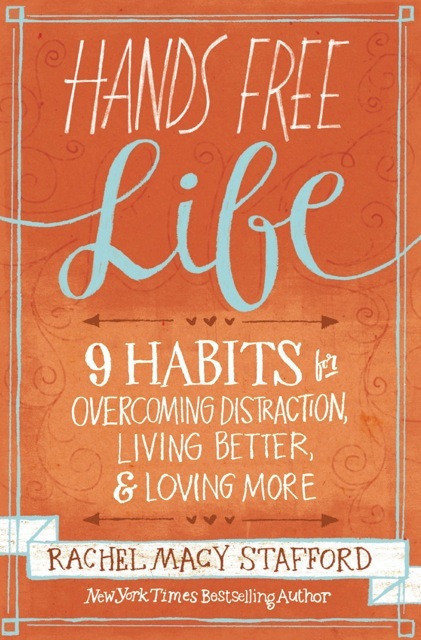 The life that Rachel paints in her book Hands Free Life: Nine Habits for Overcoming Distraction, Living Better, and Loving More is exactly what I want. I love that she offers real suggestions for leading a fulfilled and connected life despite the busyness. So often parenting articles and books focus so much on finding even more time in our busy schedules to make more significant connections with our kids and spouses. I love Rachel's reminder that "although we've been led to believe that our fondest memories are made in the grand occasions of life, in reality, they happen when we pause in the ordinary, mundane moments of a busy day." In Hands Free Life Rachel organizes the book into three sections: Creating Lasting Connections, Living for Today, and Protecting What Matters. She shares a plethora of personal stories as she guides readers through each habit (one per chapter). She also sprinkles Hands Free Life Daily Declarations throughout each chapter and I like to use them as a challenge each day. A portion of my favorite declaration says, "Today I will stop looking at images and newsfeeds that take my focus off what really matters..." Such a great challenge for me (an Instagram addict!)!! 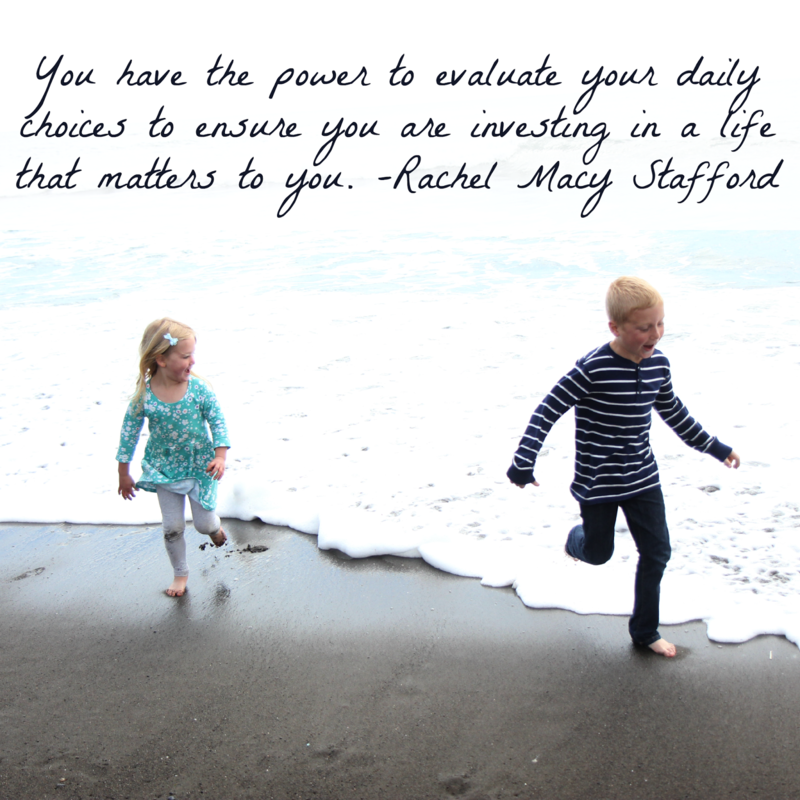 Are you up for the challenge of investing in a life that matters to you? I rarely have time to read books these days nor do I have the energy to stay awake in the evenings when I try and read. I was delighted to find that Hands Free Life inspired me so much that I was writing notes in the margins, underlining passages, and WIDE awake while I rapidly consumed the entire book. I almost finished it completely in one sitting, and then returned again and again to re-read my favorite passages and remind myself daily of goals to set. If you are looking for more fulfillment, joy, and connection as you live life (not just manage it), Hands Free Life would be a great addition to your must-read list. Rachel has an amazing pre-order offer if you order the book by the end of the day on September 7th. 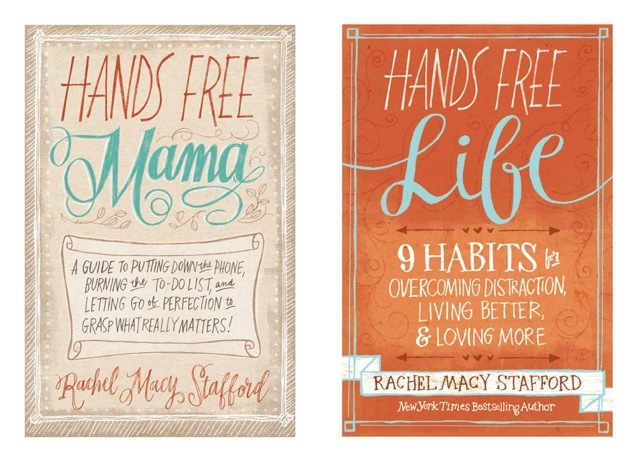 You can get a free copy of the Hands Free Mama ebook with your pre-order of Hands Free Life! Click the link, input your promo code in the appropriate location, and gain access to the ebook. How do you overcome distraction? Do you feel like you are living your life well or just surviving it? This post contains Amazon Affiliate links. A free copy of Hands Free Life was provided to me for review. All opinions shared in this post are mine. Oh my friend, you have manage to capture all my favorite aspects of the book in one beautifully written post! I don't know how you did it, but you did! I especially love how real you are with your struggles and I am touched that the habits I shared seemed achievable and inspiring to you! That is exactly what I had hoped for! I find your post incredibly affirming to my writer's heart and I cannot thank you enough for this beautifully written piece of your life! Please keep m me posted on things okay? Thank YOU for writing such a beautifully book and sharing it with me!! I just pre-ordered and am looking forward to this book arriving (and the freebie, just for Mama!). I haven't read a book since becoming a Mama and that's one reason I need this book so badly! Thanks for sharing about it! Yay! So glad Kristen. You will love it! Thank you for ordering my book! I appreciate it!